What do manufacturing best practices have in common with content marketing? Turns out, more than you might think. While the concept may have been developed in the late 1980’s to describe how auto manufacturer Toyota conducted business, lean principles offer valuable lessons for individuals in any industry. As the Lean Enterprise Institute highlights, lean isn’t a solution to a specific problem, but rather a “way of thinking and acting for an entire organization.” While cutting back on your time spent creating content is likely to lead to a drop in quality, analyzing your marketing processes to eliminate waste and increase efficiency could have exactly the opposite effect. Becoming more efficient at meeting your buyer personas’ needs could mean a higher-velocity of incredible content. And what content marketer doesn’t want that? Experts believe that Dr. Jim Womack is the man who initially defined lean principles in an academic paper written during his time at MIT’s International Motor Vehicle Program. It’s a complex concept that essentially boils down to shifting how you think about management. Instead of focusing on optimizing single processes or technologies, you examine your entire organization as a flow to your customers and prospects. Instead of putting energy and resources towards using Wordpress better, you examine whether you’re communicating sufficiently well with the sales team to generate qualified leads, and how your technology plays into that process. It’s complex, but decades of successful enterprises have proved that it’s pretty darn effective. Purpose: Who is your company trying to serve? How does your product or service fix these individuals’ problems, and how can you prosper based on optimally serving your buyer personas? Whether you’re the sole proprietor of a brand-new startup or a member of a content marketing team at an enterprise, clearly defining the purpose of your company as it appears to your prospects and customers can lend clarity to your content. Process: The heart of lean principles is reducing organizational waste. In order to achieve this goal, you need to be able to determine where waste occurs with objective measures, such as metrics and analytics. Content marketing managers may choose to use Google Analytics, a marketing automation platform or an alternative tool to discover the topics, social media networks, and content promotion methods which are driving results – and those which simply aren’t. People: There’s no room at a lean organization for employees who don’t contribute toward the end goal. Not only do your people need to be actively engaged with helping you provide value to your prospects and customers, lean systems require a watch dog. In the realm of content marketing, that means someone who’s dedicated to checking analytics and other measures of success on a consistent basis. Evaluate your success as a rule, not as an afterthought on days when you have free time. If you’ve ever doubted the value buyer persona profiles can offer to your content marketing strategy, consider the following fact: the first step for a major enterprise to adopt lean principles is actually incredibly similar to buyer persona profiling. Mind-blowing, isn’t it? Before you begin analyzing your systems, it’s critical to determine exactly what matters to your ideal customer. For the purpose of illustration, imagine you’re in the business of making gourmet cupcakes, and your ideal customer is a bride who will place a large order for her wedding. Does she value low-cost in order to adhere to a tight budget, or variety in order to satisfy her gluten-free and vegan guests? There’re no wrong answers in the exercise of identifying value, unless you’re drawing solely from intuition or guesswork. Rely on customer interviews, feedback, and other sources to determine what matters to your buyer personas. While the language surrounding the second step of lean principles can seem confusing and technical, rest assured. It’s simply a matter of understanding how you approach content marketing, in order to deliver your product of blog articles and eBooks to your end user. If your process varies drastically, or you’ve never bothered to think about this aspect of your position, begin sketching out a flowchart by hand or in a tool like Visio or Excel. Do written blog articles sit in queue until a coworker has time to edit your work? Does your ability to check blog metrics often get pushed aside in favor of other tasks? Map out how you work, in order to gain a baseline for improvement. Only after you truly understand your customers and the current status of your work can you begin to improve your processes. In the manufacturing realm, long periods of time can mean excessive waste. The same can be true in content marketing. If you’re unable to publish quickly, your newsjacking efforts could go unnoticed. If your communication with your social media department is poor, you might not be getting the content promotion mileage you deserve. Lean principles are closely tied to tight scheduling and effective communication. Take a long, hard look at how you work with others in your organization, and how effective you are at planning. If you’re not currently using tools like an editorial calendar or a simple project management software like Basecamp, it may be time to start. “Pull” is among the most challenging of lean principles to put in place. It requires the ability to efficiently gather and process customer feedback, and sufficient flexibility to pivot on a moment’s notice. 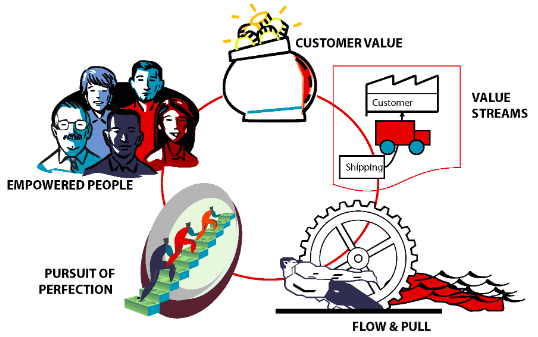 In essence, “pull” is the concept of meeting customer demand. This means waiting to plan next month’s content offer until you’ve analyzed your blog marketing metrics and performed keyword research to determine the topics which matter most to your readers. Is your audience crazy about SEO, or social media? Pull may seem complex, but it’s actually darn good business. By continually listening to your audience and changing your approach accordingly, you can consistently achieve better results. No content marketer wants to experience the disappointment of publishing an eBook that only a handful of people download. Let your blog analytics and customer feedback on social channels determine the content marketing topics you cover, and you’ll experience far more popularity than ever before. The words used to describe the fifth and final step of lean principles are key to understanding the approach. You don’t achieve perfection, you continually work towards it. Instead of blogging forever more about SEO because your metrics said so, you treat your buyer persona profiles and editorials as a living document which could need improvement in a week or a month. Instead of using Google docs to relay your publishing schedule to your social media manager, you evaluate different processes, especially when your team grows. While the internet may have changed how companies conduct business, some things never change. The companies that grow, thrive, and succeed are the ones who are always willing to change their approach. IBM was initially founded in 1911 with a mission of mass-producing cheese-slicers and electronic punch clocks. Fast forward over a century, and they’re the second-largest employer in the US, producing everything from solar energy technology to open source software. If they’d stuck to basic equipment, they’d likely have gone out of business decades ago. Take inspiration from Toyota, IBM, and lean principles, and recognize that your company will probably have to change dramatically in the months and years to come in order to continue providing value to your ideal customers. While adopting a lean approach to content marketing can seem like an overwhelming approach to content marketing, keep in mind that you’ll yield exactly as much value as the effort you extend. If you create buyer persona profiles, but fail to establish pull or the other lean principles, you’ll struggle to eliminate waste and create value for your customers. If you expend energy toward continual improvement, applying feedback efficiently, and improving your processes to publish as quickly as possible, it’s almost certain you’ll win in the end. 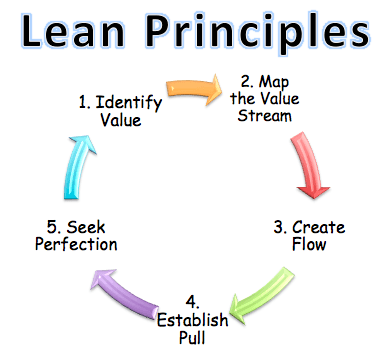 Are you familiar with lean principles for small business and startups? How do you continually improve and change your content marketing process? Yes, Mark, this book is great and gives absolutely new approach to creating companies or products under conditions of extreme uncertainty. We actually apply Reis’s principles in our work, and I may say they work!